Storm Chaser? or planning a BBQ or outdoor event? rain- critical business? Simple to use with lots of alerts - just put in your postcode; updated every 1 minute; multiple tracking options; identifies developing storm areas; PPT Track shows rain / snow fronts and showers with ETA and intensity graph; storm analysis and navigation info. Last version updated 24/03/10. New imminent rain alarm. v.5.3 - cross browser bug fixes. 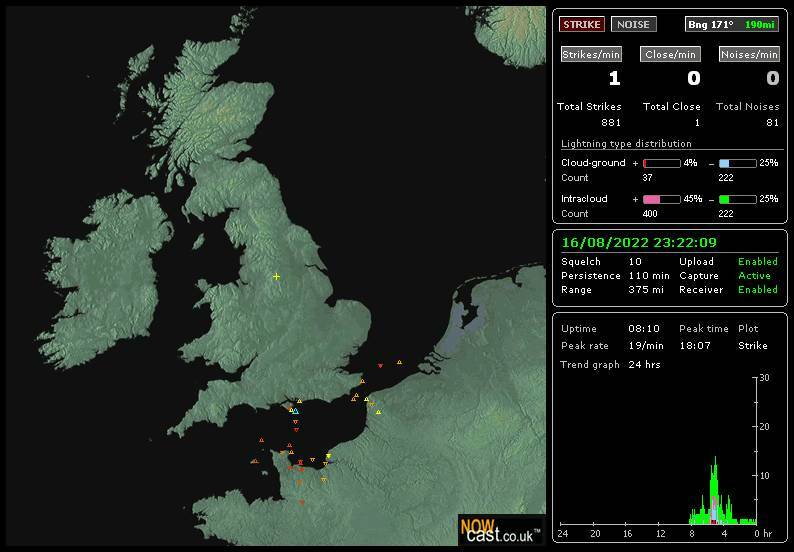 This UK lightning strike plot is updated every 10 minutes and individual strike data is kept for 95 minutes. 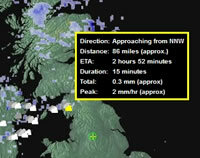 Please note that the thunderstorm report gives range and bearing relative to the station site marked with a + on the map.This image and report is generated by Astrogenic 'Nexstorm' software using a Boltek lightning detector. The station is located in the Southern Pennines, UK at an elevation of 300m, a location which makes it ideal for accurate ranging. Feel free to use image below on your site. Worried about lightning damage or are you just hooked on thunderstorms? UK storms can be equally as spectacular as continental ones if you know when and where they are likely to develop. 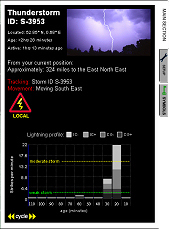 Strike Display will show developing areas of thundery activity and track progress across the UK.